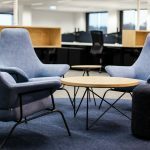 The IA Design team were engaged by the Inspector General of Taxation (IGT) to create a workplace that promoted staff engagement and provided employees with a calming oasis to balance the high-pressure nature of everyday work. A core focus of the project was to create an environment that would be enjoyable for staff, reduce stress and spark communication. To bring this vision to life, the IA interior design team worked with the IGT staff to determine the conceptual design direction of the overall space – Narnia: an escape to an enjoyable and calm oasis. 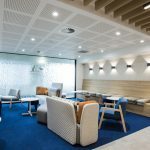 This concept drove the design palette for the space, balancing cool and warm tones to encourage the IGT staff to re-energise throughout the day. This form was carried through subtlety into the work points, effectively continuing the vibrancy and sophistication of the entry and collaboration area finishes. Throughout the design process, the IA Design team led regular staff meetings to ensure a one-team, on-culture outcome was achieved for IGT. This ensured that the expectations of staff and leadership were balanced, and all stakeholders were considered. The IGT staff love their new workplace, in particular the breakout areas and all set objectives were met and exceeded.